September is almost here! Who’s ready for Halloween?!? If you plan on making your costumes, you want to give yourself a little bit of time to research online and brainstorm costume ideas. I’ve already got a couple of fun costume ideas in the works for my boys but I know some people appreciate a little DIY costume inspiration! Check out these fun DIY kids costume ideas! I really love that Rachet & Clank costume idea, so fun! And the no-sew mermaid costume is brilliant! Which DIY kids costume is your favorite? 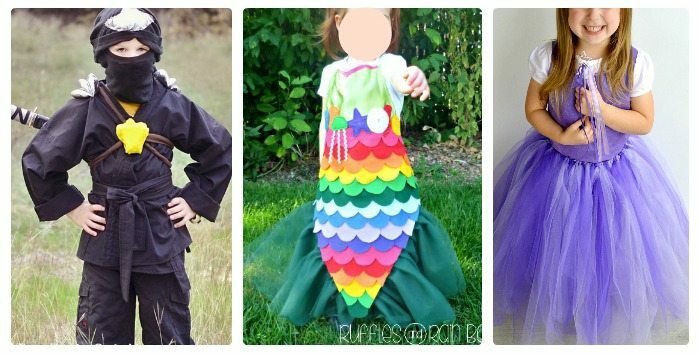 Don’t miss these other fun costume round ups with lots more DIY kids costume ideas: Disney Prince Costumes, Book Character Costumes, and Inside Out Costume Ideas.